In the decade of decadence, if the West coast had the raunch and roll of Motley Crue, then the East coast contenders could have been New York's Strike Twice. Formed in 1985 by lead vocalist Michael Hayes and guitarist Rob Luv, Strike Twice was known for their lewd and loud stage shows, girls dancing in silhouette while adult videos ran on screen. This was only buffeted by their outrageous stage antics like playing Undress Me while naked as the day they were born. I can only imagine the other lurid tales the band could tell. Despite a solid 80's hard rock sound, a vivid stage presence, and a huge regional following, opportunity never knocked at Strike Twice's door: a label never signed them and the musical winds shifted to the rainy Northwest. On first spin, my questions wondered to what I was hearing. 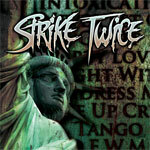 Strike Twice sounds suspiciously like Motley Crue, Ratt, Poison, and almost any other hard rock hair band from back in the day. They sound like everybody and nobody. The songs are derivative of the era with the heavier, harder rocking songs like Tuff Luck, Get It, Dirty Lover, D.F.W.M. being the better choices. However, on many of these, vocalist Michael Hayes, who has a great projecting voice, gets noticeably drowned out. The quasi-ballads Never Let Go, One Night With You, or Wake Up Cryin are bloated manifestations of the day, done better by others. Other pieces, namely Intoxication and Back Door, start well and have some fun moments, but left me unsatisfied. Probably the most commanding characteristic of this disc is the voluminous energy and enthusiasm it projects: Strike Twice was in fine form with the knobs to 11 when recording. Friends of the glory days of 1980's will find this archival compilation of Strike Twice an authentic representation of the period: blistering balls to the wall, swaggering street level, hard rock. Recommended. Friends of the glory days of 1980's will find this archival compilation of Strike Twice an authentic representation of the period: blistering balls to the wall, swaggering street level, hard rock.